My family has a shoe problem. Now I like shoes as much as the next girl, but can’t they stay in the closet when not being worn? 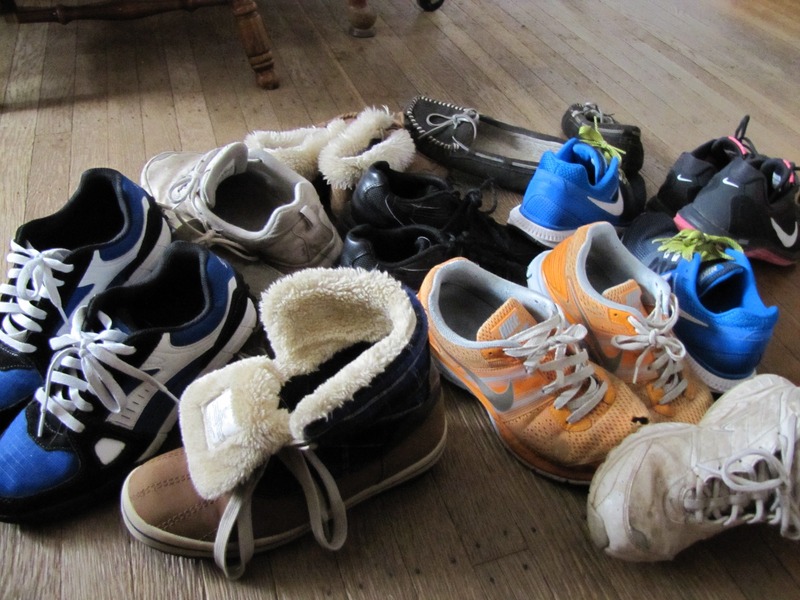 On an average day, there are no less than nine pairs of shoes in my living room (plus snow boots, just in case). For most of the year, only three people live here. To be clear, everyone in this house has a decent sized closet and some of these closets are also equipped with shoe racks. Over the summer, there are five of us (two are currently in college), which means there are likely to be well over a dozen pairs of shoes around at any given time. Over the years, my pleas have been ignored, my threats pushed off. Every so often I collect all these shoes into a pile and sit back to see the reaction. There is none. It’s as if no one sees these shoes but me. Other times, I will put them in pairs on the stairs, to be taken up by their respective owners. They still don’t see them. When do the shoes move? Either when I get tired of seeing them and drop them inside the door of their owner’s bedroom, or when it bothers me enough to complain, loudly. Then I get eye rolls and hear, “But I’m going to wear them,” or “They are not all shoes, those are boots.” Inevitably, when I have caved and put the footwear upstairs, that is the pair that is needed. Then it is my fault that someone is late.My argument that you can only wear one pair at a time is met with sighs. I have tried to institute a rule: No more than two pairs of shoes per person. All others are to be kept in closets. This too gets ignored. Apparently if it matters that much to me, I have to put them there myself. Why does this matter to me? They tend to be left everywhere. It would be one thing if they were all in an orderly line by the door (which the snow boots tend to be, but that is only because they come off at the door). They are not. They are under the coffee table, next to the couch, behind the chair, under the chair, next to the fireplace, under the dining room table. The flip flops end up under the coach (invariably not as matches. )They end up underfoot when the dog runs past and sends them flying and not infrequently are separated from their mates, causing a scramble to find one shoe when they are needed. The frantic search for a missing shoe is somehow usually my fault. The shoes make sweeping and vacuuming a challenge. Now I know I need to add to my exercise routine, but bending down to pick up eighteen shoes is not particularly appealing to me. I long for the days when my children were young and would scramble to get everything they valued off the carpet so that the vacuum would not eat it. (It took a while for them to realize exactly how large something had to be to NOT get picked up by this machine.) I have tried to push them out of the way with the vacuum, but realized having to unwind shoelaces stuck on the roller is worse than picking up shoes. It wasn’t always like this. I did have a brief spell when we had a puppy in the house, one who ate anything on the floor, including shoes (some much-loved pumps were lost this way). Once the puppy grew up and the danger was past, the motivation was gone. I have been at this for years, and see no change coming. So, I continue, picking up shoes, sometimes putting them in a place that I think someone will notice them and put them away, but more often dropping them in the appropriate bedroom. Maybe I need a puppy. Next > Why Can’t We See That We Are More Alike Than Different? Love this. For me shoes are less the issue than socks! There are never any pairs left…because of the dog! It’s always the dog… That’s a whole other problem! I am so guilty of leaving my shoes near the front door. That would include three different pair of snow boots (in the summer) and walking shoes/work shoes (all year round). I’ve never owned a dog, so perhaps that’s why I’ve never broken myself of the habit. And let’s mention my husband and his size 14 contributions.